This weekend marked a milestone in my journey back to my pre-baby weight. I finished my first 5k since I had <A>! This may seem like a small feat to some, but it was a big step for me. I successfully completed both my goals; I ran the entire thing under the time I set forth for myself. Beforehand I was really nervous and I mentally prepared myself in case I needed to walk part of the course. I didn't want to be too hard on myself since half the battle is just getting out there and holding myself accountable. But I never stopped running and I am so proud of myself for completing and pushing through until the end. I actually came in 57th overall and 3rd for my age group which is a much better overall place than I ever expected. 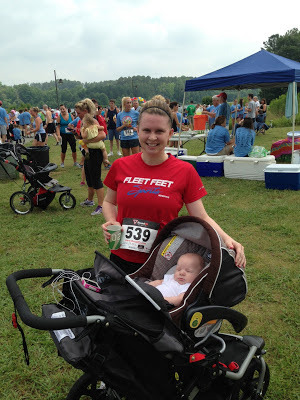 Plus my time was right on par with 5k's I ran before I was a Momma. The race itself was a perfect reintroduction to the 5k world. It was a small group running to raise money for childhood cancer. The course was beautiful, through a local park, and it looped around a lake. It was really humid but luckily most of the course was shaded and through woods. I got a much-needed boost right at the last turn when there was sudden but steady perfectly light breeze. In addition to the run, it was <A>' s first time at the park. It was wonderful having him and my husband there to cheer for me and it gave me that extra bit of encouragement I needed to push through the finish. My husband's been so encouraging and I can't wait to sign up for another race. Next time I want to make an afternoon out of it and bring a little picnic. I also want to start running races with <A> at some point. I take him on my jogs in the neighborhood but it's a lot more work then running solo. Hopefully I can build up the strength and endurance to push him for my next 5k. Now I just need to keep up my fitness regime, which is easier said than done. How do you stay motivated to drop the pounds? Way to go girl!!! That is a BIG deal! Congrats! Thanks so much Angela. I'm thinking about signing up for another race in 2 weeks hopefully I can keep my streak going!!! Way to go! That's awesome. I need to get back into running! Thanks so much, I was really happy with my results. It's tough getting back into it but it's so fun (and hard) with the little ones. Maybe Aubrey would enjoy it too!? Congrats Brittany! I'm so happy for you!